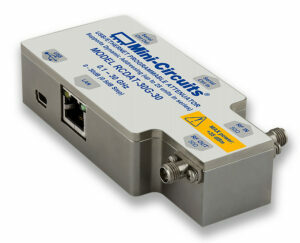 Mini-Circuits’ RCDAT-30G-30 is a precision programmable attenuator covering an extremely wide bandwidth, from 0.1 to 30 GHz. Its unique design allows attenuation settings to be programmed from 0 to 30 dB, in 0.5 dB steps withmonotonic attenuation change per dB, even at the highest frequencies and attenuation settings. The attenuator can be controlled via USB or Ethernet, allowing control directly from a PC, or remotely over a network. Full software support is provided, including our user-friendly GUI application for Windows and a full APIwith programming instructions for Windows and Linux environments (both 32-bit and 64-bit systems). This model also includes Mini-Circuits’ novel dynamic addressing daisy-chaining interface which allows multiple RCDAT-30G-30 attenuators to be connected together into a Master / Slave chain, with independent control of each attenuator channel through the single USB or Ethernet connection of the master unit and no need for the user to set addresses, or use any specialized control unit. Each ZTS system can be configured according to your requirements, with switches mounted on the front or rear panels and RC connections using SMA or N-type female connectors.